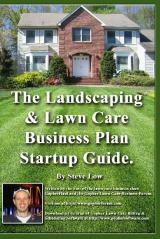 « Lessons from my first year of running a lawn care business. 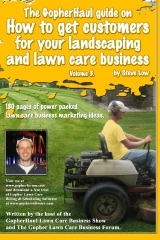 Home owner’s association lawn care bid proposal example. 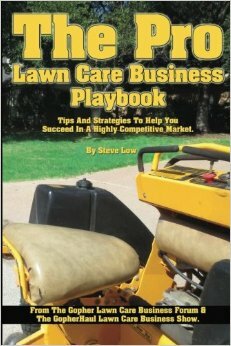 It can be quite a daunting task to put together your first commercial lawn care property management bid. Finding the right wording and comparing how your bid looks with others can difficult to do because your local competitors are probably not going to want to share this information with you. 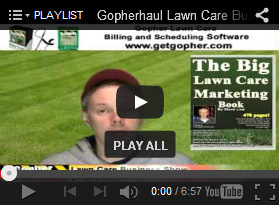 Well thanks to a member on the Gopher Lawn Care Business Forum, we have this great commercial lawn care bid proposal to look at. You may possibly even want to use it as a template in your future bids. He wrote us “here is a bid I recently submitted for a local home owner’s association that is a collection of a number of condominiums. 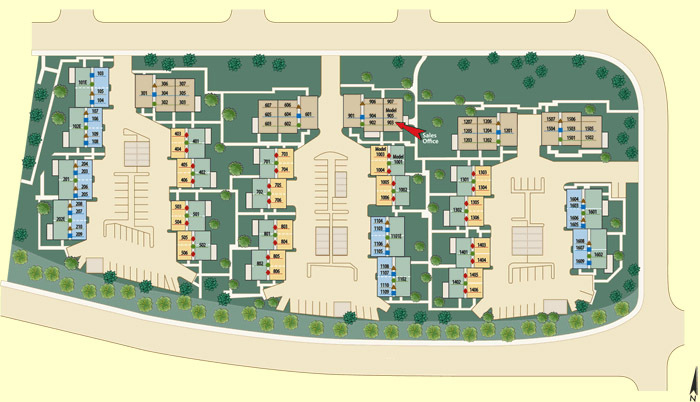 The property size in total is about 184,000 sqft, that includes building and parking lots. I think seeing the way I put the bid together will really help others to create their own bids. 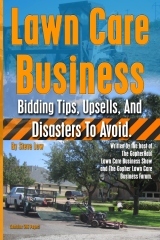 Once you submit your landscaping bid, I’ suggest you follow up with a phone call and/or stop by within 3 days to see if they have any additional questions. This landscape management form says it all. 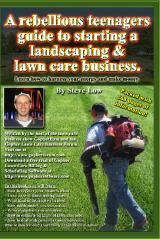 Please see enclosed “Commercial Grounds Care” for scope of services. 1. Many trees are infested with aphid / scale: need injection with insecticide. 2. Must address infestation of insects in some plants. We propose hereby to furnish material and labor - complete in accordance with the above specifications, for the sum of: One thousand eight hundred dollars ($1,800.00) per month, payment to be made as follows: on a monthly basis. All material is guaranteed to be as specified. All work to be completed in a workmanlike manner according to standard practices. Any alteration or deviation for above specifications involving extra costs will be executed only upon written orders and will become an extra charge over and above the estimate. All agreements contingent upon strikes, accidents or delays beyond our control. Owner to carry liability, fire and other necessary insurance. Our workers are fully covered by Workers Compensation Insurance. This proposal may be withdrawn by us if not accepted with in _____ days. Acceptance of proposal - The above prices, specifications and conditions are satisfactory and are hereby accepted. You are authorized to do the work as specified. Payment will be made as outlined above. 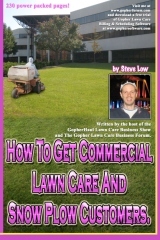 Please sign enclosed “Commercial Grounds Care” and return with this signed Proposal. 1. TURF CUTTING~ All turf areas shall be mowed once per week or as needed to maintain a neat appearance. The cutting height will be 2-21/2 inches. This height will be lowered in the fall to promote sturdier root systems throughout the winter. Excess grass remaining on turf will be racked. Light thatch promotes organic decomposition and will remain. 2. TRIMMING~ Areas inaccessible to cutting equipment will be trimmed with “weed-eaters” and manual trimmers. 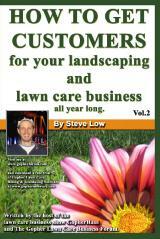 This includes step ares, poles, along buildings,fences,utility boxes,and shrub beds. This service will be provided after every cut. 3. EDGING~ All sidewalks and curbs shall be edged every cut as needed to keep a neat appearance. All debris shall be removed from sidewalks and curbs. 4. 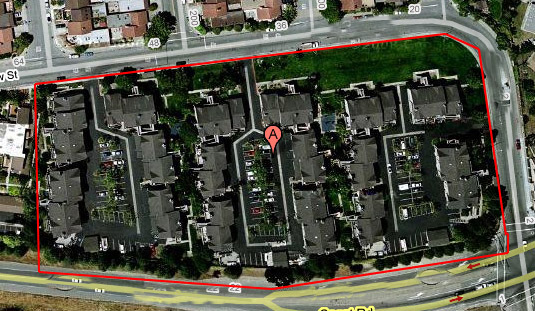 SIDEWALK NEEDS~ All seams and cracks in sidewalks and curbs shall be kept weed free through chemical/manual control. 5. LITTER~ All turf areas will be policed for litter and trash prior to each cut. 1. PRUNING~ All ornamental tree (under 10 feet), shrubbery and ground cover, will be pruned as needed to maintain a neat appearance. Any branches of shade trees inhibiting passage on walkways or streets will be trimmed. In addition, root suckers will be removed as they appear. 2. BED MAINTENANCE~ All beds shall be maintained weed free throughout the season. 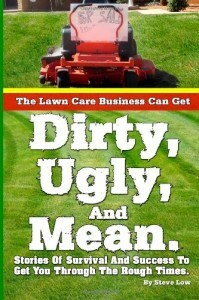 Weeds that are under 1.5 inches will be chemically sprayed. 3. MULCHING~ Bed areas will be periodically raked to maintain a fresh appearance and remove foreign materials. Periodic inspections will be made to determine the need for additional mulch. 1. FERTILIZATION~ Lawns will be fertilized in accordance with specific needs of the grasses to maintain a healthy and vigorous condition. Balanced fertilizer contain trace elements will be applied as needed during the following three time periods: early spring,mid-summer /late fall. 2. PRE-EMERGENT WEED CONTROL~ Application at 80lbs per acre shall take place during mid-March for crabgrass. (one application) Further applications are an additional charge. 3. BROADLEAF WEEDS~ Systematic herbicide in early-spring to control broadleaf weeds and promote thicker turf growth shall be applied. 4. 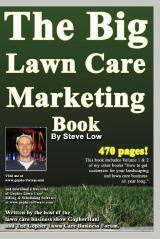 INSECT AND DISEASE CONTROL~ will be suggested when needed at an additional expense. 5. 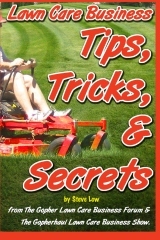 AERATION~ We recommend this during Spring at an additional expense as needed. 1. FERTILIZATION~ All ornamental trees,shrubs and ground cover will be fertilized in early spring. 2. INSECTICIDE~FUNICIDE TREATMENT~ When infestation occurs,the appropriate process will be suggested at an additional expense. 1. IRRIGATION~ Automatic irrigation systems and clock schedules will be periodically inspected and monitored for efficiency. 2. MINIOR REPAIRS~ @ $40 per hour on a time and materials bases. 3. 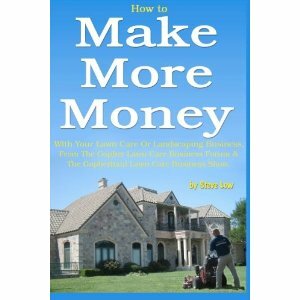 MAJOR REPAIRS~ Time and material with approval from client @ $40 per man hours. 4. HAND WATERING~ Additional Service. To be reviewed each visit for trash, fallen sticks, limbs and other debris. Available as an additional charge. 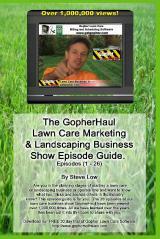 You can down load this lawn care property management bid at the Gopher Lawn Care Business Forum. Here is the letter I sent to the property manager to initially get placed on their bid list. 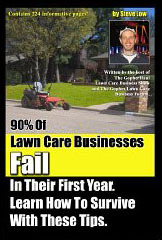 Lawn care business letter sent to property managers. 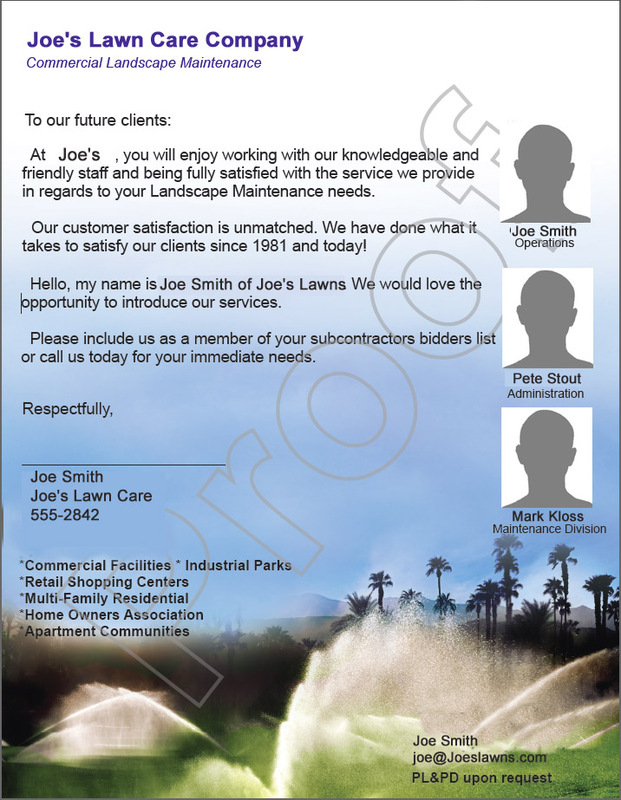 This entry was posted on Thursday, December 1st, 2011 at 4:28 pm	and is filed under Commercial Customers, Edging, Fertilization, General Business, Hedge Trimming, How to Estimate - Services To Offer, How to Estimate Jobs, How to get, Landscaping Business, Lawn Care Business, Lawn Care Business Sales Letter, Lawn Care Customers, Lawn Care Marketing, Lawn Mowing, Marketing, Mowing, Parking Lot Cleanups, Pricing, Property Management. You can follow any responses to this entry through the RSS 2.0 feed. You can leave a response, or trackback from your own site.